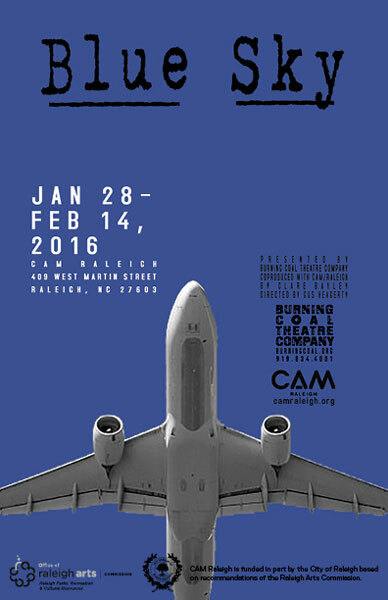 CAM Raleigh presents the US premiere of Blue Sky, a play by Clare Bayley, co-produced by Burning Coal Theatre Company and CAM Raleigh, funded in part with an Innovation Grant from the City of Raleigh Arts Commission. This funny and troubling play is about a photographer who inadvertently snaps a picture of something he shouldn’t have. Directed by Gus Heagerty, Blue Sky marks CAM Raleigh's first theatrical production and features artwork by Derek Toomes and an accompanying exhibition, super-vision with artwork by Toomes, Kevin H. Jones and Chris Cassidy. Purchase tickets for the US premier of Blue Sky here! Starting January 28th, performances at CAM Raleigh on Thursdays through Saturdays at 7:30 PM and Sundays at 2 PM. Open Rehearsals will take place January 26th and 27th from 6 to 7 PM. Free to the public. No reservations necessary. Please plan to stay for the full hour.